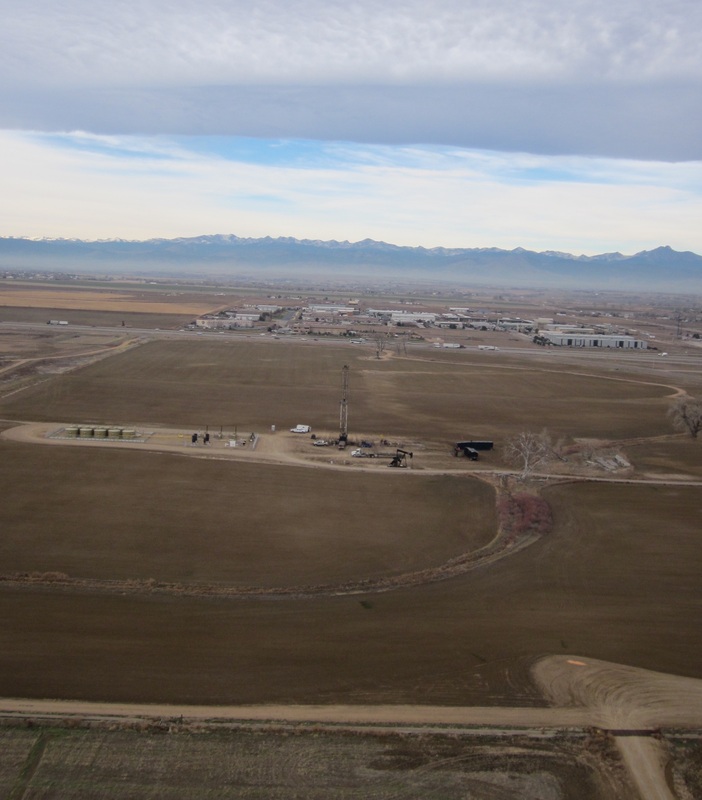 In a strange turn of events, I recently received more than $5,000 as a “signing bonus” for leasing to an energy company my share of the mineral rights in an 80-acre parcel of Weld County, Colorado, just north of Denver. Several years ago, when inquiries from oil and gas companies first trickled in, I was shocked, indignant, and extremely curious. In the first place, neither I nor my sister and cousins had been aware that we “owned” anything in Colorado. But more important: I have seen GASLAND, I know about fracking, and I have seen pictures of Weld County as it is today. How extraordinary that I might have the opportunity to defend its land, air, and water! As a less naive heiress might have realized, I did not have that opportunity. It soon became apparent that the laws of Colorado (and several other states) have been written to allow drilling for oil and natural gas without consent of the owners through a system known as “shared pools,” or more accurately, “forced pooling.” If owners do not agree to lease their property, it’s a boon for the energy companies: they make even more money because they pay only the minimum royalties required by statute. This is not news to those who know about the political history of the natural gas boom and of fracking, but we discovered it only gradually, and with the advice of lawyers. While we tried to find out what we could and could not do with our horrifying windfall, I investigated its origins. Why did I inherit about 5% of some mysterious rights, and from whom? I very slowly discovered a story about a place – Denver, Colorado, and its once-beautiful surroundings – and about people, the first a great-grandfather who traveled to the Rockies for his health, and the next a grandfather who loved his city and state and believed that land was the source of all value. It was Grandfather who purchased certain rights in Weld County – “rights” that permit a form of exploitation of the land that some of his descendants find deplorable. And then there’s my father, who left Colorado in his twenties but passed on to his children an abiding love and respect for the high country. At the core of the story, though, is the new Colorado Gold Rush, which has brought medical and environmental catastrophes to people whose ancestors – like mine – went West for their health. and learned at an early age to be a hard worker, a bit of a hustler. Grandfather began by selling newspapers and delivering groceries, and somehow got himself to the newly-established law school in Boulder in time to graduate with its first class in 1894. (He attended the University of Colorado for only two years, both at the law school; that was enough, in those days). Afterwards he practiced law in Denver and kept up his enterprising ways, buying and selling land and houses and sometimes moving his family into a new house for a better deal. I wish I had known him, but he died not long after I was born. In 1908, Grandfather and his law partner formed a company with the grandiose title of “Imperial Securities” and the intention, according to a report prepared by our lawyers, of “acquiring real and personal property in Colorado.” In 1924, when the Texas oil boom was exploding all over the American West, Weld County must have looked like a promising investment, and in that year Imperial acquired the mineral rights to the 80-acre parcel. The investment apparently came to nothing, and indeed my grandfather died “land poor,” not on account of those mineral rights, but through the failure of an irrigation project in the southern part of the state. Imperial Securities itself dissolved in 1936, not long after my grandfather’s death. However, it “remains the record title owner of the Subject Minerals,” according to the lawyers; the property itself (the mineral rights) was never conveyed out of Imperial. I suspect that in 1936, in the midst of the Great Depression, the property seemed worthless. Also, my grandfather was apparently the member of the partnership who got things done, and after his death, the business of Imperial may simply have lapsed. My father (Bethuel Matthew Webster, Jr.) was eight years old when the company was formed in 1908. I don’t suppose he knew anything about Imperial Securities at that age, but I’m sure he had already learned to love Colorado, as he did to the end of his life. I remember a road trip West with my parents when I was a teenager: when the Rockies appeared in the distance across the sugar beet fields, Dad sat up straighter at the wheel, drove faster, and began – uncharacteristically – to whistle. By that time he had lived in the East for more than a quarter of a century, but he frequently reminisced about his boyhood, especially about horseback camping trips with his father among the mountains and trout streams. My father called my grandfather a “romantic” and wrote in a privately-printed memoir that “[he] often talked about the ‘simple life,’ meaning, I think, an out-of-doors life.” Of course, my father was another romantic – an ambitious and successful New York lawyer who amused and annoyed his children by going on and on about hunting, fishing, and old-time root cellars. In 1876, the year my great-grandfather Grove Webster arrived in Colorado from Pennsylvania, oil was first discovered in Colorado. A century later, in the 1970s, the new Gold Rush, or drilling boom, got under way, bringing new kinds of wealth to Weld County, historically a rich agricultural center for cattle and sugar beet production. The boom grew exponentially in the 1990s, when hydraulic fracturing, which had been used for more than a century, was combined with newly-developed techniques for drilling horizontal wells. As horizontal drilling – and the resultant insistence on forced pooling – took over, the present-day controversy grew fierce. It rages today: defenders of fracking, with a great deal of money and political clout behind them, point to “good” jobs for Colorado and greater energy independence for the United States. In 2005, in the Bush-Cheney years, their clout was sufficient to push through the “Halliburton Loophole,” an infamous exception to the Safe Drinking Water Act of 1974. The loophole allows oil and gas companies to inject chemicals of an undisclosed nature – many of them highly toxic – into “fracking fluids,” into or near underground water supplies, without regulation by the EPA. Opponents argue for banning fracking entirely – at least, fracking near cities and towns, or at the very least, strict and effective regulation. They point to poisoned land, air, and water – to polluted streams, ruined farmland, and sick people. By 2012 the “directional” or horizontal fracking boom had all but obliterated Weld County with the number of permitted oil and gas wells. My sympathies, as must be obvious, are with the opponents, as are those of many members of my family. My elder daughter, a fracktivist in New York City, found our Colorado lawyers through Josh Fox – Mr. GASLAND himself. 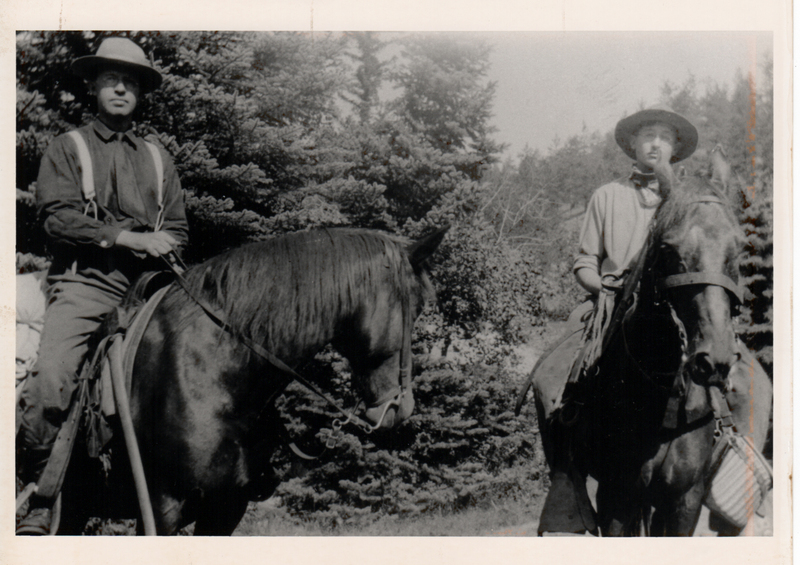 My nephew Webster Hogeland, a Virginia lawyer, handled the correspondence with the Denver attorneys – even offering, at one point, to ride west on horseback to deal with our legal affairs. My sister and I are sending our ill-gotten gains back to Weld County, to an environmental organization whose mission includes the effort to ban fracking altogether. 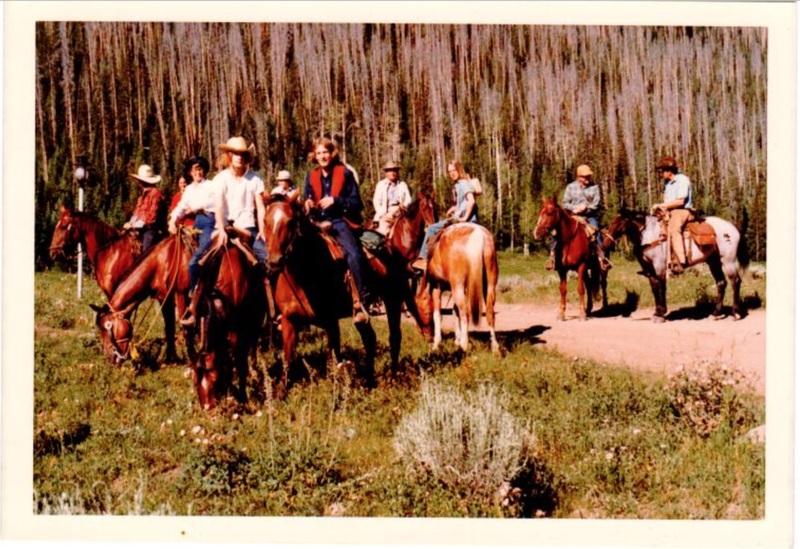 I traveled West with my father and my teenage children and their cousins in the summer of 1972, for a week of horseback riding and fishing in Routt County, west of Meeker, where Dad had spent time as a boy. After a great deal of discussion, once we understood that we could not use our mineral rights to prevent fracking in “our” 80 acres – that to refuse consent would simply make more money for the energy company – we signed the leases. In our various ways, everyone in our family has had to come to terms with this baffling legacy: from a grandfather who loved his native state, we inherited money derived from “rights” that allow corporations to contaminate its air and water, to tear apart the land he loved. Comments, below, and reblogs most welcome. For a related post based on a wonderful letter I received from a first cousin in connection with this matter, see P.S. : Mining in Colorado, 1951. Thank you, Crissy, for alerting me to your blog and this excellent writing about the dilemma your “inheritance” presented. The concept of “split estate” boggles my mind, and I can only surmise that it was dreamed up by a mine owner and his cunning lawyer. My own son is an environmental attorney in DC, so the love of protecting our land runs strong in the family. You may be sure that I will be sharing your writing with him soon. I have just been introduced to your blog by my husband Jadie. As a relative newcomer to the US and having seen Gasland we too find this windfall bizarre to say the least. The “carry on fracking” mania is leaving a terrible legacy for our progeny. Looking forward to reading more of your blogs Crissy. There’s something about Atkinson’s tone that makes all the high hilarity and low-down meanness of this riveting, revolting, but also bizarrely entertaining. It is, in fact, what the world has come to. Plus, her writing is always so clear, that I never once have to pause and figure anything out. She’s done all the work for us, which I so appreciate. I love reading these pieces. It’s some of the best writing on the web. Period. The Halliburton Loophole, no matter what it’s about. Thank you, and please write it! Another brilliant essay. Irony abounding notwithstanding, I see what you mean about the complications of family, ownership, law, fracking, big business, beauty. I cannot help but think of Montana. Another fantastic piece. Loved the historical, political and environmental background. Also, you and your family’s persistence and getting to the bottom of things.